A picture speaks a thousand words – This saying was apt when there was no World Wide Web. Today, a website speaks a thousand words. Your website is your brochure, the front face of your business. It informs your customers about your capabilities and offerings. So it has to be the best to leave your competition behind. And, you need Webcreater for this.People searching for services and products have limited attention span. If your website doesn’t grab their attention in the first minute, your competition will benefit. Your website should give your prospective customers all the information they require at a glance while being user-friendly and aesthetic.We, at Webcreater, have taken website designing and execution to a new level. We use inspired and flawless website designs to keep your website visitors yearning for more. 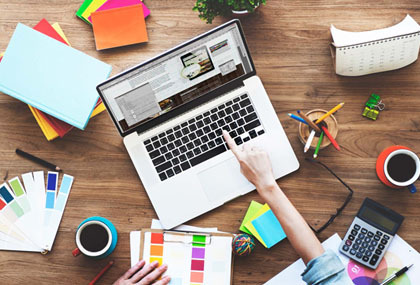 Our team of highly talented and skilled web designers, graphic designers, SEO specialists, programmers and copywriters work cohesively to provide you complete website solutions.You can rely on Webcreater to take your website from the conception stage to the forefront of the World Wide Web, giving you an edge over your competition. We start from the scratch with the website design to seamlessly capture your vision about your organization, and then build it from there to make that vision into a graphic representation through your site. We understand the business needs and the same is conveyed in our work. Our services include HTML5 Development, Responsive Web Design, Mobile UI, Infographic Design and Print Media Design.We ensure, that all websites are built using latest technologies and are responsive in nature. Our team comprises of CMS experts who has in depth-knowledge of the tools and technologies that make a huge difference. We use developing tools that are state-of-art. When human brains and technologies are used together, the result is always a masterpiece. As a reputed responsive web design company, we will help you build a website that will have same functionality, user experience and appeal across devices, whether it is a desktop, tablet, or a Smartphone. Our professional web design services ensures that it's not just page breaks but a website build for excellent mobile human experience across multiple devices! our team's proven track record in delivery of projects that helps you achieve your business objectives.